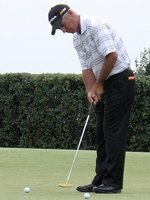 Corey Pavin - Golf's greatest putter...? Corey Pavin could be placed among the list of great putters solely on his performance in the three successive Ryder Cup matches that he played in. Nevertheless Pavin has enjoyed success in major championships too, most notably his 5-wood to the closing hole at Shinnecock Hills en route to victory in the 1995 US Open. As the standard of his golf game diminished, Pavin took on the responsibility of Ryder Cup Captain for the 2010 matches at Celtic Manor. However, his putting touch is perhaps the one part of his game that stayed with him into his playing career on the Champions Tour. Date of birth: November 16, 1959. Claims to putting fame: A well-acclaimed putter from both long and short range, who rescued a number of holes for the USA in the Ryder Cups between 1991 and 1995. With his trademark Bullseye putter "Bulldog" as he is better known had a square set-up with a 'normal' routine and rythmic stroke to match. "Obviously I like the Bullseye putters in general," Pavin said in an interview with Sports Illustrated. "But the shaft on this one is really good. It's soft and it just feels very good to me. So for me, it has a lot to do with the shaft, but that shaft probably wouldn't work on another head." Though Pavin hasn't a clue what model shaft is attached to his Bullseye, he knows it works for him - something that you should always bear in mind when choosing a putter. 1) Address the ball as normal with your standard grip (right-below-left for a right-handed player). 2) Relax the grip pressure in both hands and turn them out roughly half a turn each (clockwise for the right hand, anti-clockwise for the left). 3) Make sure that you have achieved the feeling of both elbows being locked into position whilst maintaining a light grip on the putter. While this may not be the everyone's answer to better golf, it is a small change with a big difference for Corey Pavin.